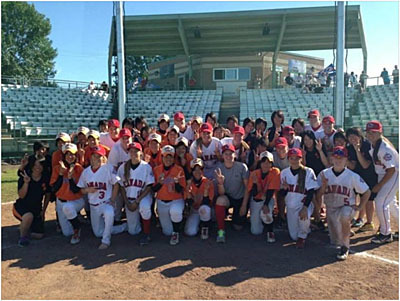 GRANBY, QC- The Saitama Sakae Orange (4-1) proved to be the best team at the Canada-Japan Women’s Series scoring a run in the bottom of the sixth to earn a 3-2 win over Canada White (2-3) in the gold medal game. After Canada White tied the score at two on a Daniella Matteucci (Fruitvale, BC) two-out RBI single, the Orange went ahead 3-2 in the bottom half of the inning. Reliever Stacey Fournier (Langley, BC) hit the lead-off batter and after a ground out and single, the runner scored from third base on a fielder’s choice. Canada White received a solid effort on the mound from starter Brinley McLaren (Brantford, ON) who went five innings and gave-up two runs on five hits, while striking out four. Jenna Flannigan (Cornwall, ON) scored the game’s first run in the top of the first when she was hit by a pitch, stole second and scored on a pair of Orange errors. The Orange got the run back in the bottom of the second and went ahead with a run in the fifth. Katelyn Bedwell (Surrey, BC) had a pair of singles and Amanda Asay (Prince George, BC) doubled to pace Canada White’s offence. In the bronze medal game, Canada Red scored three runs in the third to erase a one run deficit and added four in the fourth to go on to a 10-3 win over the Saitama Sakae Beavers. Autumn Mills (London, ON) did it on the mound and at the plate going 2-for-3 with three RBI and tossing six innings to earn the win. Mills’ single scored two runs as part of a three run third, while Stépanie Savoie (Québec, QC) hit a two-run double as part of a four run fourth. Canada Red had 14 hits with Mills, Savoie, Daphnée Gelinas (Le Gardeur, QC), Kelsey Lalor (Red Deer, AB) and Emilie Laliberté (Granby, QC) collecting two apiece.